What a privilege it is to be alive today. We live in a world filled with wonder. Many more opportunities than ever before present themselves to us and we have a wealth of information and knowledge at our fingertips. Technology and science are developing at a rapid rate. We are constantly bombarded by new ideas, options and opinions. Not only do we have an abundance of information and technology at our disposal, we are also free to explore and discover without any boundaries. We are free to pursue and examine any topic, idea or ideology we want to. There are no limits as to where we may examine or investigate. We are greedy for more and more knowledge. It is interesting to note that with all the knowledge mankind is gaining about the natural, as well as the technological world, the more we start searching for spiritual answers and enlightenment as well. Mankind is hungry to understand more about the origin, the psyche and the soul of man as well. Of course there is nothing wrong with learning and expanding our knowledge. In order to progress it is important to open our minds and vision to broader insights, to look and search beyond what we know now. However, with all the information, theories and perceptions out there, it is important that we keep our moral compasses in check. It is very easy to be confused by all the information and different dogmas we encounter. Faith is a very personal concept and very precious. It is worth protecting and preserving. 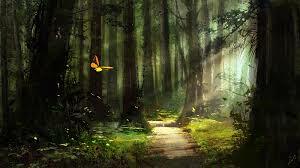 To me faith is the sunlight falling through the trees lighting up the forest, guiding me along life's path. Without it I would be lost. Therefore it is important that I safeguard my heart against the forces that may want to lead me astray, wanting to guide me along a different way of enlightenment. Whatever belief system you adhere to, it is important to listen to the voice of your faith in order to stay on the path. Often different religions come to us in the guise of our own beliefs, wearing a similar cloak, saying familiar words and it is easy to be led astray, therefore it is important to test their words and ideas against your own system of faith, to compare it with discernment. If we fail to do so we could soon find ourselves without a compass, lost in the forest.